I hear there’s a storm on the way. There’s been a lot of talk about changing around the running plans over the next few days to accommodate the visit from Irene. Â From what I’ve seen so far, there is a chance of some rain Saturday morning. Rain will increase throughout the day. Sunday morning will be rainy but the hurricane will not hit our area until later in the day. All that of course will change dramatically over the next 48 hours (I predict once it hits North Carolina it breaks up and we’ll just have a rainy weekend). With a hurricane on Sunday, even though I think we’d just be running in the pre-hurricane rain, I can’t schedule a run and feel confident everyone would be safe. I’ll open the floor to all involved though. Let me know what you prefer, and if we come to someÂ consensusÂ we’ll reschedule the run or unofficially have a fun run in the rain Sunday morning. What do you all think? This week’s run was a real half marathon run back in the 1990s. It evolved and moved around and is now the Run to Remember in Boston, but once upon a time it ran through our streets. 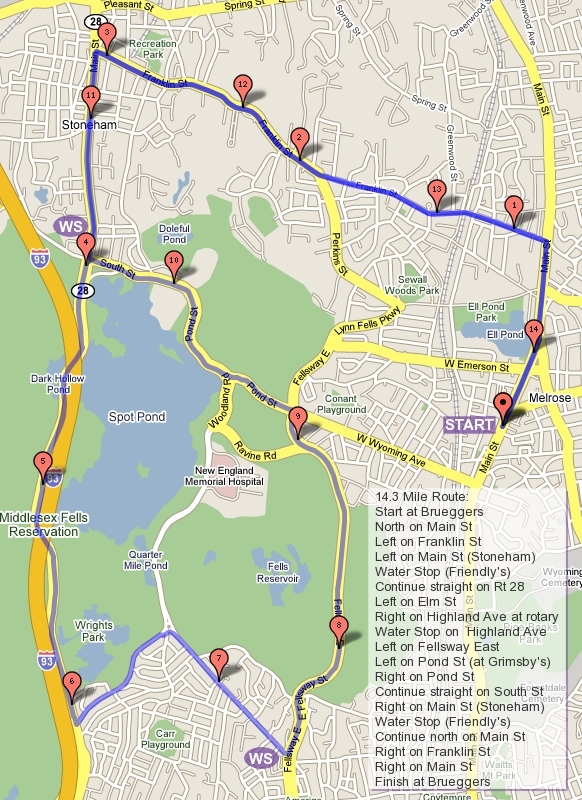 So Sunday we’ll run over to the starting line and run the entire route of the Melrose Law Enforcement Half Marathon. Well, almost the entire route, the last quarter mile was run along the Melrose High School track which no longer exists. The route will take us over to the Lynn Fells. Long runners will do a loop around Ell Pond while shorter distance runners will take the lead through the Lynn Fells to Grimsby’s. After the loop the long runners will follow behind to Grimsby’s. From Grimsby’s we go along the Fellsway East hills to Highland Ave and water stop 1. Shorter distance runners will follow the front side of the pond (from the Melrose perspective) to Pond St, back by Grimsby’s and down Wyoming to Brueggers for a 7 mile run. If you’re looking for an extra mile head back past the high school the way you came for 8 miles. Us longer distance runners will loop Spot Pond clockwise. That means around the back side of the pond (Elm St to Rt28 past the Sheepfold first). A quick stop for a sip of water at Straw Point and then continue along the front side of the pond (past the zoo to the hockey rink) and then back to the first water stop. Turning up East Border Road where all runners tend to curse me for the hills, we make our way back to the Fellsway East to Brueggers. One last sip of water will start us off for the last stretch back to Melrose High School to Main and to our bagels and coffee to celebrate one more training run done!Â When you’re done running the Half, you’ll be done with half of your training for a mid-October marathon! Woo hoo! Water stops. We need one big stop and two little stops this week. I like to have Â a car with some water and gatorade at Grimsby’s and one at Straw Point (the parking lot near the Friendly’s end of Spot Pond). Â The temperature should sit in the 70s for most of the run but the sun and the humidity will probably warrant an extra cup of water along the way. So first lets see if there are any people willing to man a stop. We could safely cover the whole run with two, one at Highland Ave and the other covering Straw Point and Grimsby’s. If not I need two sets of pairs of volunteers. Each pair would need someone to buy two gallons of water, two gatorades, and plastic cups (we’ll cover the cost) and park at the stop before the run starts. The other in your pair will pick you up and get you to Brueggers on time. One set will handle Straw Point, the other will handle Grimsby’s. Any volunteers? I can work with someone to cover Grimsby’s. Other than that, get yourself ready for some fun hills tomorrow! Who’s in? Bruegger’s 8AM! ROLL CALL!!! Tomorrow we should get some pretty decent weather for our step up week. Long runners will be upping the miles to 16 tomorrow, shorter distance runners will be at 8. The course will take us over to Winchester, along the Fells, through some hills, and back again. Take a look at the map, this one gets a little confusing. Water stops will be at Eugene St and the end of Highland Ave. We could always use a third at the Flynn Hockey Rink as well. I could use two or three volunteers. If you’re running shorter, consider parking at Eugene and running the middle part of the run, then you can help with the water stop as well. If someone can man a stop, they could help with 2 and then move on to the Flynn Rink after. Let me know if you can help. If you can meet me at Brueggers in the morning I’ll give supplies there, otherwise if you’re leaving your car I’ll bring the supplies to you and drive you back to Brueggers. Who can help? Who’s in for this week’s run? I think we’ll get some vacationers back. We might lose a few to the Falmouth Road Race, so I don’t think we’ll have a full crowd tomorrow. Let me know so we can plan supplies. See you tomorrow, Brueggers, 8AM!